作者: The AsiaN Editor on 23 January , 2017. Japan has called on the Korean government to remove Dokdo Island from a map on the 2018 PyeongChang Winter Olympics website, fueling the sovereignty dispute over Korea’s easternmost island. According to Japan’s news outlet Kyodo News on Friday, the country’s Ministry of Foreign Affairs demanded that Seoul alter the website, on which the island is shown as Korean territory on a tourist map. The Japanese ministry also complained the sea between the Korean Peninsula and Japan is shown as the East Sea, as Koreans call it, not the Sea of Japan. The incident comes amid a conflict over the Gyeonggi Province Council’s plan to erect a “comfort woman” statue on Dokdo. Japanese Foreign Minister Fumion Kishida claimed Tuesday that Dokdo belonged to Japan, strongly rejecting the placing of the statue on the island. “Marking Dokdo as Korean territory on the website breaches Olympics Charter’s Rule 50 ― rules for the game adopted by the International Olympic Committee (IOC) ― which prohibits any demonstration of political, religious, or racial propaganda at any Olympic sites, venues, or other areas,” said a Japanese ministry official. Japan added that introducing Dokdo on the website as a “special place in the hearts of Koreans as they hold pride in defending Korea’s easternmost reached territory” in English and French, was political propaganda. 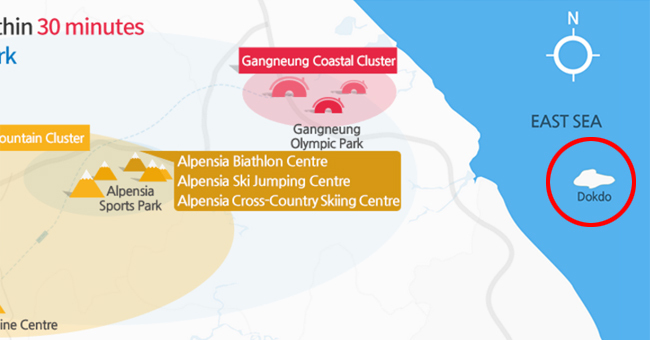 PyeongChang Organizing Committee officials on Friday rejected the Japanese request. “What they are asking is preposterous and not worth a response,” said PyeongChang Olympic committee President Lee Hee-beom. Noway!Please leave on Dokdo!Leave a alone Dokdo there!Don’t touch the Dokdo Island!